At Galleria Farsetti in Florence an exhibition of works by De Chirico and Warhol from January the 14th up to February the 18th 2012. At first it might sound strange to bring together such mythical figures, finding out a liason between the metaphysical painter and the founder of the Factory. Two worlds apart, artistically and geographically. 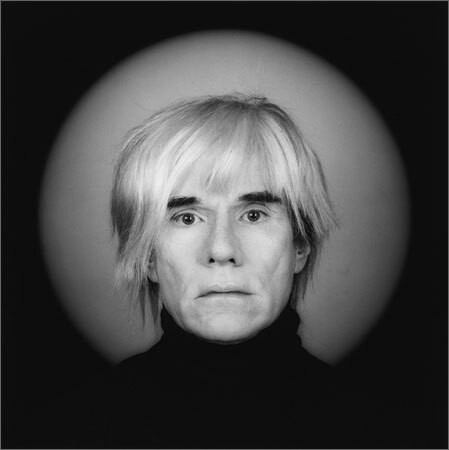 But as the artistic director of the art gallery says, they both share serial character techniques, an obsession turned into style by Warhol and a planned purpose by De Chirico who repeated, in the fifties and sixties ,the same themes and subjects of the twenties. The two artists are getting near because, as the art historian Achille Bonito Oliva says, they are able to bring to the forefront images which, though featuring their own times, leisurely live outside the storms of history. The thirty works from private collections celebrate the Metaphysical Movement and its pop interpretation by the genius of the Factory. The connection between De Chirico’s European culture, rooted in the Greek and Roman worlds, and Warhol’s American one is based on a real meeting in New York City in 1974. 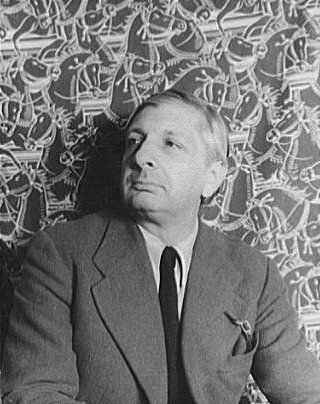 De Chirico, an acknowledged master in the European artistic milieu, was at the time 86, while Warhol, 46 of age, was then the undisputed leader of the New York vanguard. The two outstanding stars symbolically continued their dialogue even after De Chirico’s death in 1978 thanks to Carlo Bilotti, an Italian- American businessman and collector who commissioned Warhol 20 works drawing on the Italian metaphysical painter. 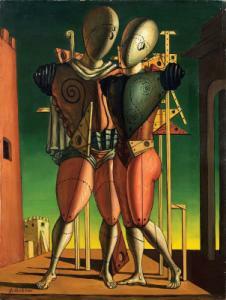 The result was the subsequent exhibitions” Warhol versus De Chirico” in Rome in 1982 and in Hamburg one year later. Here in Florence the main focus is Warhol’s Hector and Andromache after De Cherico’s one, dating back to 1917, here on show, together with the bronze sculpture featuring the same subject of 1971. Warhol reinterprets according to the canons of pop art the last hug of the Trojan couple near the Porte Scee, before Hector’s deadly fight with Achilles. The magic world of the Italian painter evoking a faraway and glorious past is confronted with the present consumerist myths of the American life . In spite of that, the spirit of metaphysical painting is kept alive in Warhol’s faithfulness to emotional silence and objectivity. In addition the repetition of the dummy- lovers in compliance with consumerist serial characters deprives Hector and Andromache of their sacred features and establishes a controversial parallelism with the Campbell soap tins or the Coca Cola bottles. 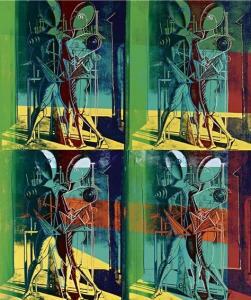 In such a “contamination” Warhol has become a classical artist, standing side by side with De Chirico. An occasion for an intriguing winter escape to the heart of Tuscany, profiting from one of the many accommodations in Florence.